I'll stick with the "number of cars in the Horseshoe Casino Parking Lot" indicator. And, it's in the tank. I hope this Conference Board indicator is right on. I sense the Fed needs to get aggressive. Is a Japan scenario unfolding? They have had 20 years of deflation, tight money, and limp to flat economic growth. As Milton Friedman said, interest rates do not tell you if money is tight. Money is tight if inflation is dead and economic growth in the tank. Despite the braying on half-witted Nipponistas, that is where we are now. Inflation dead, and economic growth faltering. That's very enlightening, Benji. I had no idea Friedman said that. Hmmm, so Beckworth is a Keynesian, eh? Unfortunately for John Taylor, we have Milton Friedman's own words on this matter. Taylor is a nice guy, but a Republican. He allows party politics to eclipse true economic analysis. Not sure MF ever said that. Find hard cite, if possible. "I know of no severe depression, in any country or any time, that was not accompanied by a sharp decline in the stock of money and equally of no sharp decline in the stock of money that was not accompanied by a severe depression." "The Federal Reserve definitely caused the Great Depression by contracting the amount of money in circulation by one-third from 1929 to 1933"
A lot of right-wingers try to claim the Friedman mantle. Friedman supported legalized drugs, progessive consumption taxes to pay for the military, no homeowner mortgage tax deduction, but taxes on pollution, and lower government spending. I wish the right-wing would embrace the real Friedman. Only Benji, who supports socialist health care and the minimum wage, is a true Milton Friedman disciple!! Are you going to say you have never taken advantage of the mortgage deduction? Welfare Benji is no better than Michell Bachmann! I own commercial property, and I take advantage of mortgage expenses and a business expense. Judging from your sniveling, ad hominem commentary, you are unhappy in Texas. Have you thought of relocating to another Third World state or nation, such as Mississippi or Guyana? You might find happiness in a nicer place to live. Ease up on Mississip, there bro. 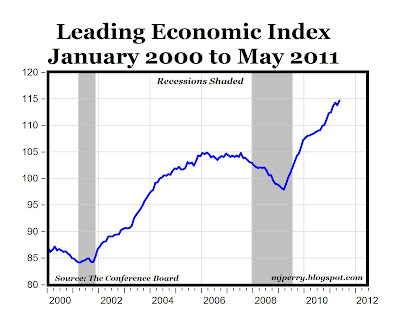 Despite some recent signs of a temporary slowdown in certain areas of the economy, the ongoing upward trend in the Leading Economic Index that started in the spring of 2009 suggests that the economic expansion will continue through the rest of 2011 without interruption. Do you really think that the trend will continue if the Fed stops its liquidity pumping operations? It is not a big trick to show some growth if you are running a massive deficit and using newly printed money to finance that growth. But any rational economist will tell you that such 'growth' is not real and not sustainable. 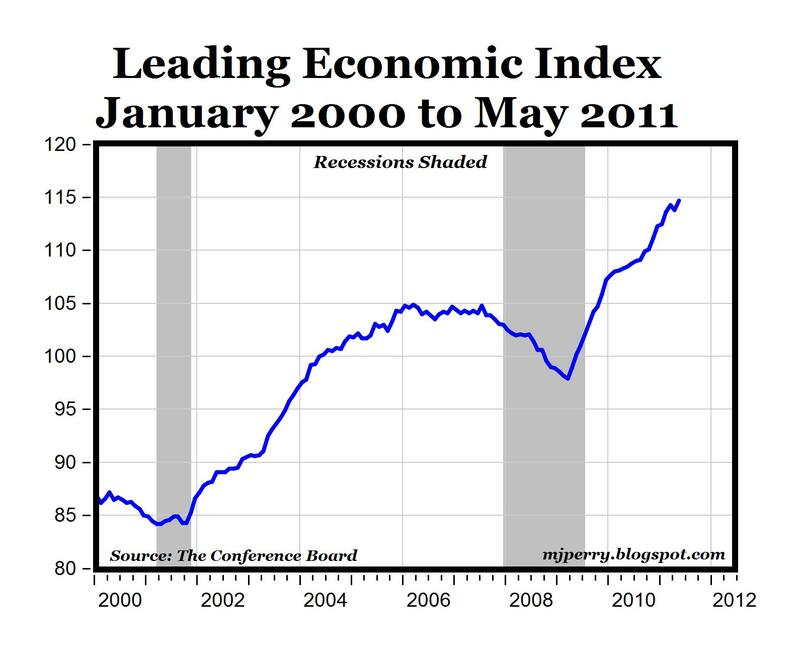 The real economy in the US is in big trouble. Grain carryovers are a big problem and will put pressure on food prices. Oil supply conditions are ensuring that the 2005 record peak in conventional crude production will be difficult if not impossible to surpass. OPEC is in disarray as producing nations are now in decline and no longer able to use profits to buy off an angry public at time when the price it pays for its food is going up. The US banking system is in big trouble as the EU area banks are ready to cash in on their default swaps. Unfunded liabilities are piling up. The US is involved in several hot wars around the globe. So you will excuse me Mark if I do not drink the Kool-Aid and remain a skeptic. "I know of no severe depression, in any country or any time, that was not accompanied by a sharp decline in the stock of money and equally of no sharp decline in the stock of money that was not accompanied by a severe depression."" that is a totally indefensible statement. i'm sure i could come up with some more examples if i tried. you are also dead wrong about current money not being lose by any sane definition. real interest rates are strongly negative, even if you believe the CPI. CPI is running at an annualized rate of 3.6%. that makes the real one year rate -3.4%. yet we see no growth nor job creation. the reason is that you cannot create these things through monetary policy. printing money destroys real wealth and redistributes it inefficiently. the prudent are punished as their savings erode. the reckless are rewarded as their debts shrink. this incentivizes more bad behavior in the future. as ever, your understanding of economics appears to be a bunch of misunderstood dogma and rattle headed repetition of the same claims about japan and money that have been debunked 100 times. you're like a sock monkey. pull the string "print money!". inflation is anything but dead. it's high and rising. it's economic growth that is dead because of the idiot loose money policies you champion. they turned an easy bubble to clean up (internet - equity bubble in productive assets) into the hardest kind of bubble to clean up (housing - debt bubble in non productive assets). it is not coincidence that the rise of this philosophy has seen the 2 weakest recoveries from recession since ww2 along with the most concentrated set of bubbles in US history, massive debt accumulation, and real wealth destruction. that's because it doesn't work. as you are painfully susceptible to evidence and unable to think clearly, i doubt you bother to look at the evidence and see that you have no support for your arguments at all, but i really recommend you give it a try. you are dogmatic because you do not understand. you appeal to authority because you cannot comment substantively. it's as tiresome as it is devoid of value. Oh yeah pseudo benny, just were are those alledged words of Friedman applauding the printing of worthless money?